With Pearson English Readers, learners can enjoy reading at any English language level. With Pearson English Readers, English learners will be motivated to read, learn and succeed. Bring learning to life! Through the wonder of storytelling, students enjoy what they’re reading and are more motivated to read, learn and succeed. Give students the opportunity to choose a reader that is right for them. Choose from a large selection of books and film-based titles across 13 different genres, suitable for all age groups. Engage with young learners. Content Language Integrated Learning (CLIL) Readers, original stories, contemporary stories and Poptropica stories help kids discover the world around them and expand their vocabulary through a variety of topics. Make the most of your Readers with additional teacher’s resources including Teachers’ Notes, optional Activity Worksheets and audio CDs. 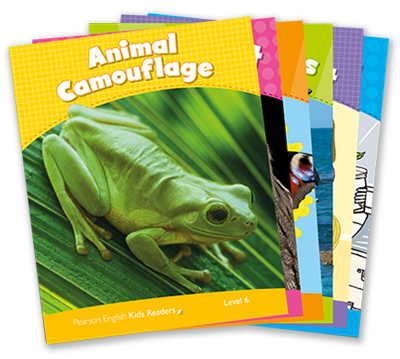 With the teacher’s resources you can bring more practice into your classroom or set homework, improving your students’ reading confidence, topic comprehension, vocabulary and spoken and written English. What makes each Pearson English Readers series different? Award-winning stories that inspire and motivate teenage and adult learners to read in English. Full audio files and teacher materials are available with every book for in-class and self-study use. Wide variety of stories that offer an intensive reading experience to support and develop learners who wish to deeply understand the text. Additional tasks, assessment and progress tests are available in the book and on the packaged CD. Content Language Integrated Learning (CLIL) Readers help kids discover the world around them through topics such as art, science, and geography, presented in English. This series has an incredible range of popular titles, authors and genres graded across seven English levels and correlated to the CEFR and Global Scale of English (GSE). Works best for English learners who will be reading on their own time: for fun, at home, in the park, on the train, on the beach, with a hot drink, during holidays or for the sheer pleasure of reading. This series is more intensive than general Pearson Readers, with comprehension exercises included throughout the book. Pearson Active Readers supports English language reading and learning at five levels. Works best for English learnerswho will be reading at school or in the classroom: for English classes, to prepare for English tests and exams, to improve English vocabulary, for struggling readers who need more structure, for collaborative learning. This series, written for 6-13 year old English language students, includes exciting factual stories that help young students learn and improve English by discovering interesting facts about the world around them. They’re perfect for Content and Language Integrated Learning lessons (CLIL). Look for this symbol in the Catalogue section to see which Readers have digital editions. You can then purchase them from the Kindle store directly. Who can use Pearson English Readers? Teachers and schools who want their students to succeed in English tests and exams, and who are looking for truly pleasurable extensive reading to improve their students’ reading skills, vocabulary, listening, speaking, and language comprehension on eReaders and in print. Students (adults/teenagers/kids) who would like to bring more enjoyment to their English learning routine, immerse themselves in world-famous stories, model listening and find out about topics beyond their coursework on their eReader, iPad or in print. Learn more about the users of Pearson English Readers. Pearson English Readers stories are rewritten by world-famous authors including Roald Dahl, Jane Austen, Charles Dickens, John Grisham, Robert Ludlum, Oscar Wilde, Rudyard Kipling, Anita Roddick, Arthur Conan Doyle, William Shakespeare and many more. There are also original titles, both fiction and non-fiction/CLIL, written by award-winning ELT authors such as Nicola Prentis, Tonya Trappe, Caroline Laidlaw, Paul Shipton and Melanie Williams. All titles are adapted for English learners by highly-skilled ELT specialists.